Top climber at very low cost and taylor made . Just invent with the things at disposal. Total Cost concerning only for clips = 45 Euros. I used very often in the last summer without any difficulties and easy to go up in total safety and first of all all done ALONE!!!! You don't need help for getting up. Can you please post exactly which specific parts you use and how they interact? I'd certainly be interested in being able to go aloft alone. I use the same thing, two Petzl ascenders with webbing foot loops(ASCENSION | Petzl) on one tight spinnaker halyard, then a simple figure-8 descender on a loose halyard to get back down plus for use as a backup. Ok I try to explane, but it should be much more easy in italian. Anyway...both the apparatus are uesd togheter, one upper then other. to be "in security" I use 3 ropes. One is connected through the Petzl Gri-Gri and it is linked with the simple system adpted for the feet (wite in the picture), and the another the same for the seat. The third one is for safety . Acting alternatively with each of them you can go up moving yourself as a worm . The two Peztl going up block the rope, always alternatyvely. In this manner you will be easily on top. When you have to go down back be carefully to act n one gri-gri and afteron the other one putiing attenction in avoiding to have your weight on the same rope as you give away the block. Another method is to use a "discender" . It is absolutely strong and confortable and sure, buta always it must be put care . For this reason the safety rope is important. I'm sorry for my english so I hope you understand an my explanation is sufficiently proper. I have also may mail if you want pvernaschi@yahoo.it. Do you need photos? Nice, but not so nice if the boat moves (e.g. in the seaway). It is not 45 Euros. If you start from scratch, buying appropriate climbing gear to go up (and DOWN) the mast safely singlehanded will cost you about the same as the Topclimber. I took a good look at the Topclimber and then went to my local climbing store. I bought gear that I feel is safer and possibly even more idiot proof. I also received free lessons on how to use the gear and I can go back for refereshers everytime I forget how to do it. stevern clearly already owned some gear and has climbing knowledge - that is how he did it so cheaply. barnakiel - you actually have many options on controlling your motion in a seaway with the climbing gear. You are still going to take a beating, but you have better odds of surviving the ordeal then if you are simply hanging on the main halyard. Or is the Topclimber actually fairly safe and easy to use on a rolling boat? My low buck aproach to the Top Climber. I was going to go the mountain climbing gear route instead of a Top Climber. Went down to REI and asked a salesman, I'm not a climber, to help me with what I needed. As soon as he understood what I was trying to do he refused to help me and wouldn't sell me the needed gear. Seems the Attornies have scared the crap out of them with looming law suits. I went back later and educated myself on what I needed. Didn't find the proper foot stirrups, the ascenders were quite expensive, and the harness didn't look all that comfortable. Seemed that I could probably do a Top Climber Clone for about 2/3rds the TC cost. Since they didn't have exactly what I needed figured I'd have a lot of hours designing sewing and testing what I had to make up and then it might not work as well as the TC. Decided in the end to just spring for the Top Climber and save myself the wasted time, hassles and headaches. The TC has been great especially since I changed the halyard I use to climb to a low stretch synthetic. Don't need anyone to help me climb which is great since I mostly work alone and the other boat owners in the marina almost never come down to their boats. I wouldn't be able to get anything done on the mast without the TC. Apart from the 6-1 that we use after reading all the things you all have tried I tried another system yesturday. 2 pieces of 6mm three strand polyester rope 2.5 metres long spliced each piece into a loop. 2 stirups from a sadlers shop. Tie the stirups one to each loop. Attach each one obove the other to a halyard with a prusic knot. safety line to harnes and a carabiner to the climbing halyard to stop swinging out from the mast. I climbed a 12 meter mast in 4 mins and stood at the top for 30 mins without foot ache. then desended to the deck in 6 mins as I was a bit tired. all done in safety. I am 63 and have had a triple heart bypass 14 years ago so not very fit. The stirups were Sally's idea and were very comfortable to stand on for along time. What's a pair of stirrups worth? be aware that a lot of climbing gear is made to work with ropes in a small range of diameters, are sailing ropes/lines the same diameters? and educate yourself in how to swap gear from ascending to descending before you go up the rope, i didn't the first time and had to work it out up the rope! i made my own 'mast mate' for less than $100. 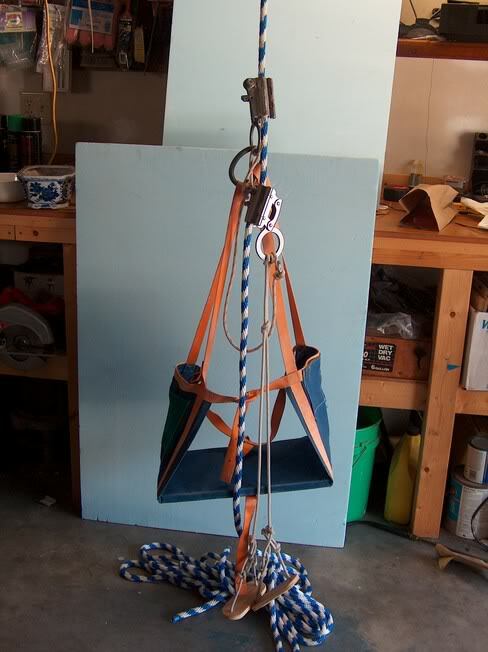 for those of you not familiar with the mast mate it's basically a canvas ladder that you hoist up with the main halyard. belay the line and climb the ladder. it's better to remove the mainsail altogether and then use sail slides attached to the mast mate to hold it close to the mast, and when that's possible it's what i do. if you google the mast mate you will get a quick idea of what's needed. i did mine with extra heavy webbing - heavier than the mast mate - and, instead of trying to stitch the parts together, i used stainless bolts and large fender washers. it's extremely rugged and reliable, although i still wear a harness and tie it off to another line with a prussik knot as i ascend/descend. if i'm going to be up there awhile i can haul a bosuns chair up behind me and, when i get to the top, tie it off, sit, and be comfortable. a whole lot easier and more comfortable than the top climber and it's copies. Oh dear! How did that transpire?